Now trying the UPlanApo 40 0.85 with U-DP40 (wrong prism) and U-DPA40 (right prism). 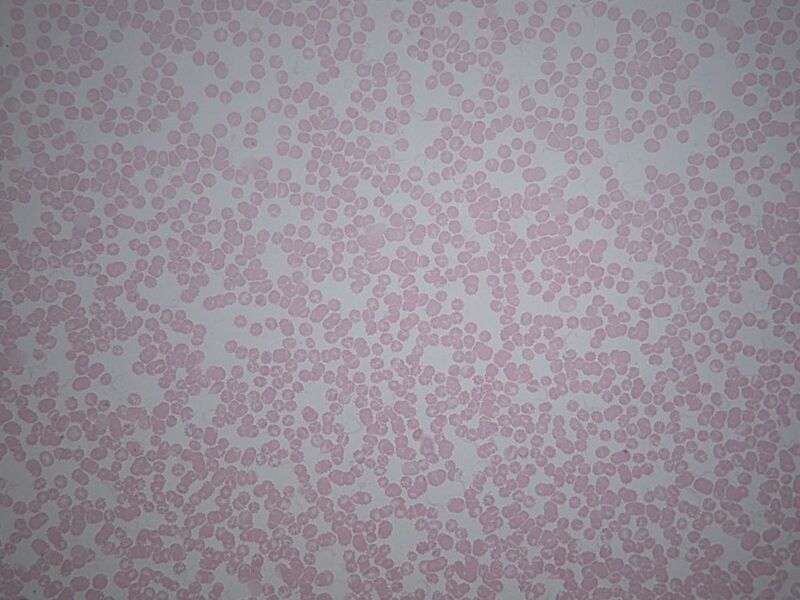 The subject is a lightly stained blood smear, a legacy slide from Flatters & Garnett. 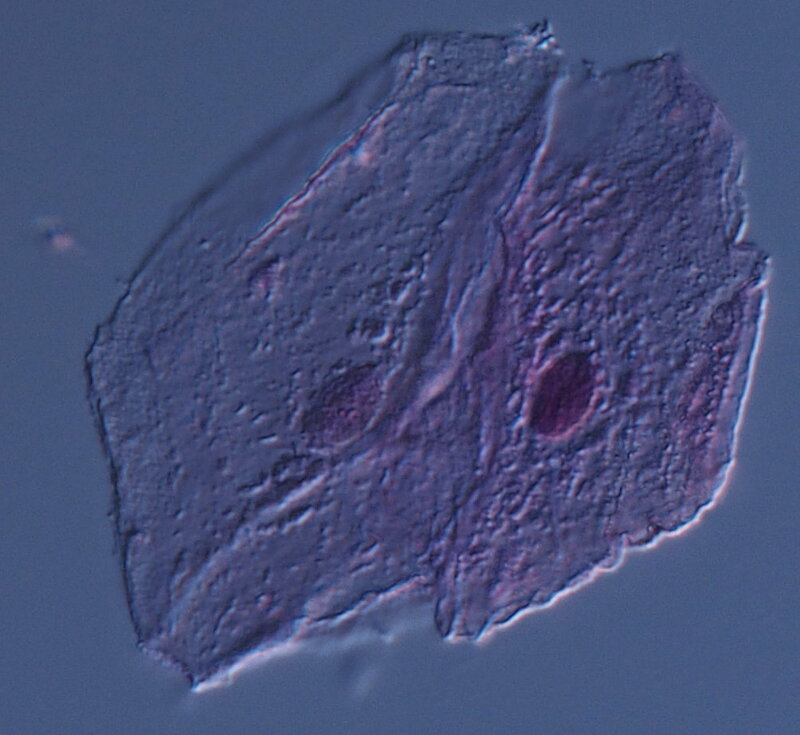 The barely visible "squiggles" among erythrocytes are Trypanosoma gambiense. I don't know why the erythrocytes show so many "blebs", but sure it was not a good sign for the patient if it was an in vivo effect and not an artifact of fixing. Brightfield, actually nicer than the visual impression, which was of very low contrast. U-DP40. Not that bad for the wrong prism. U-DPA40. Right prism, topmost DIC prism adjusted for maximum extinction. It looks somewhat wrong. U-DPA40, topmost prism adjusted just one side of the maximum extinction. The pseudo-3D effect now looks good. Just past the maximum extinction in the opposite direction it is also very similar. In this case, the difference between the "right" and "wrong" prism with the UPlanApo 40x is not that great. The "right" U-DPA40 displays a slightly more uniform background than the "wrong" U-DP40 outside the maximum extinction setting, but the difference is much less than the night-and-day difference between the two prisms for 20x objectives in my previous post. Where the U-DPA40 likely beats the U-DP40 is the maximum NA, since the clear opening of the U-DPA40 is much wider than the U-DP40 and accepts a wider cone of illumination. 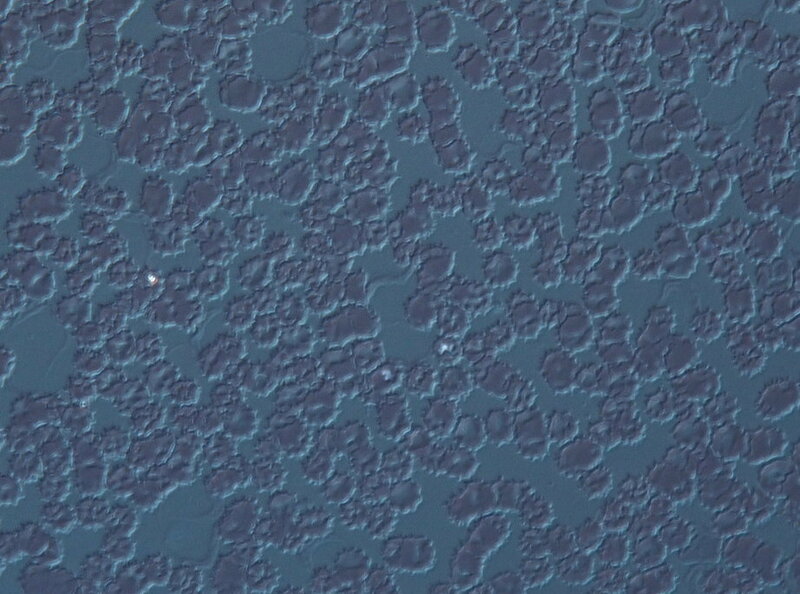 This cannot be seen in these small images, but 1:1 pixel crops shot with the condenser diaphragm fully open to NA 0.9 seem to show more detail with the U-DPA40. Now my question is how to best get to 100x, and whether it is worth it. 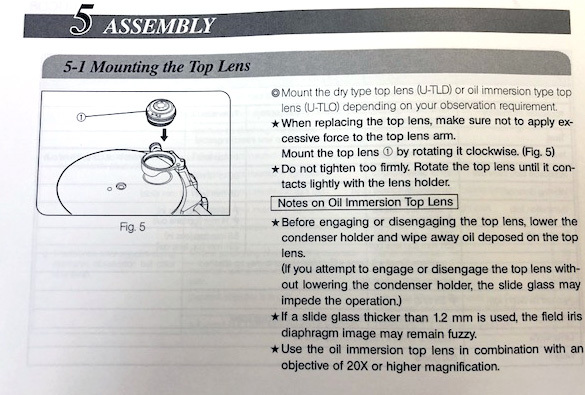 I can already exclude getting an oil top lens for my condenser, since it would require an all different set of Nomarski prisms (besides being difficult to find used). Also, I already have a U-DP100 prism, so if I get a 100x objective, it will be for using it dry and with this prism. 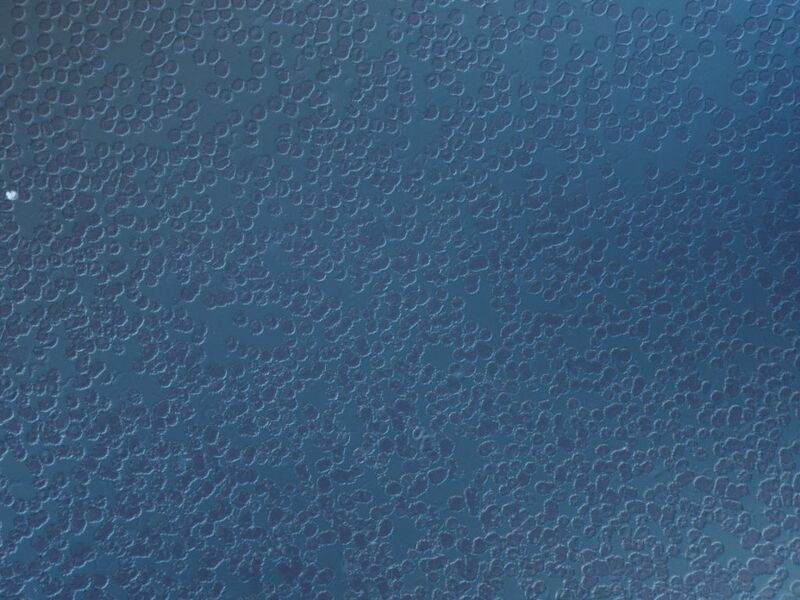 The U-DP100, according to the Olympus literature, can be used dry with the "UPlanApo 100XOI3". Interpreting the 100X part is no problem, O stands for oil immersion, I should stand for iris, but I have no idea about the 3. As far as I can see, there is only one UIS UPlanApo 100x for oil immersion with iris (which ranges from NA 0.5 to 1.35), and it says on the barrel "UPlanApo 100x /1.35 Oil Iris infinity/0,17". Any ideas if it is the right one? As an alternative, I could use with the same prism a "UPlanFl 100XO3" or a "UPlanFl 100xOI3". I assume that a UPlanApo would be better, so I did not look into these UPlanFls. I don't know why the erythrocytes show so many "blebs", but sure it was not a good sign for the patient if it was an in vivo effect and not an artifact of fixing. Nope, this is just due to dehydration of the erythrocytes, this is known as crenulation . It's a typical observation when blood begins to evaporate or when the medium becomes hypertonic due to the addiction of solutes. You can easily see it if you prepare a slide of your own blood. I have a similar slide with round red cells. The DIC effect is there, but not very convincing. The darkest position is mainly to set the system, DIC is obtained when you set the prism to give some shear with the typical gray background. 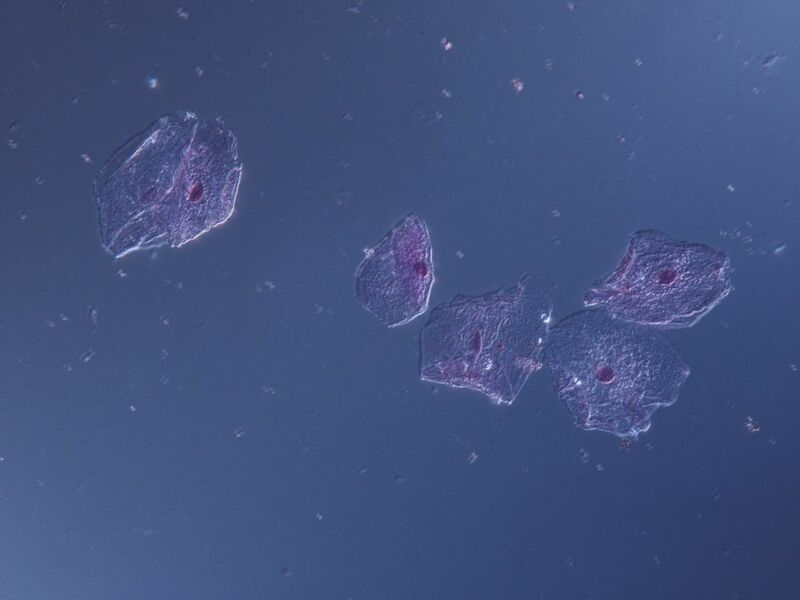 Again prepared slides often are problematic for DIC, why do not test fresh specimens like your mouth mucose "cheek cells"? 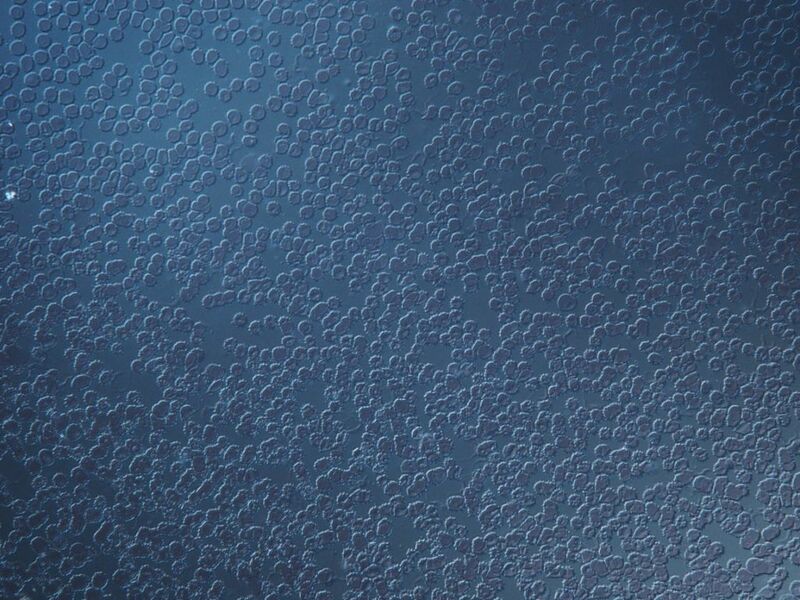 Another observation: the BF image also shows some light unevenness, try to eliminate it setting Köhler properly. Likely DIC will also improve its evenness. A proper White Balance and some levels correction will clearly improve the images. Thanks Pau, lots of good pointers in your answer. Especially, I had missed the obvious - one should use the oil immersion 100x objective with oil on the objective side and dry on the condenser side. In this case the resulting NA 1.1 should make a significant difference from the NA 0.85 of the 40x. The pictures are intentionally unprocessed. 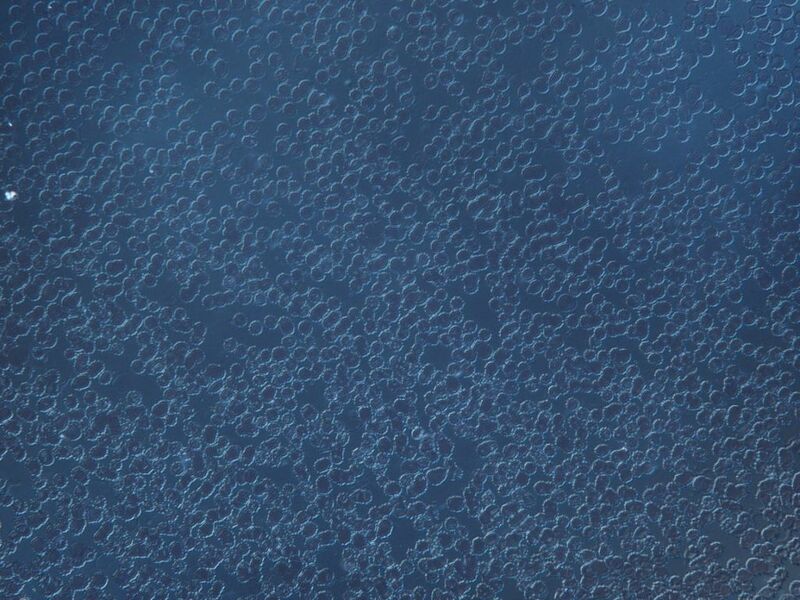 I could make them look much better, but my goal for now is duplicating as much as possible what I see through the eyepieces to expose any faulty adjustments of the microscope. The classic formula needs to be applied and interpreted with care. With an air gap between the condenser and the slide, I think the maximum possible NA is 1.0. It is not possible to exceed 1.0 unless oil (or some other liquid) is used to bridge the gaps above AND below the slide. I'm not so sure of this point, if true the classic formula would be just trash. If true the formula would be: "the smaller NA of the system components"
I think that the most limiting factor is the objective NA. My initial assumption was that the NA of the condenser is the first limiting factor, and the NA of the objective is the second. Whichever NA is lower "wins". Another way I looked at the problem is that the condenser neither knows nor cares which objective is being used. If the condenser provides a maximum NA of 0.9 (in this specific case), any "excess" NA of the objective (1.35 for the 100x objective oiled to the slide) should just be wasted, since the peripheral part of the (potential) cone of light entering the objective will be dark. In many cases lowest NA is determining whole system resolving power. You always get some light diffracted (darkfield like effect) on specimen (even TIR is possible to register) but usually this signal is so weak that it's usually impossible to register on properly exposed photography. Sometimes, if object is scattering a lot, stopping down the condenser becomes almost irrelevant (you cant see apertures with auxillary microscope anymore). Inspired by discussion quoted above, i've failed to find anny difference between stopping iris in objective vs stoping condenser iris only in phase (what you use DIC for) subjects. I should also add, as this might not be very obvious, dont scratch your head too much about DIC and resolution. DIC is trading so much resolution for contrast sake, that using 0.9 vs 1.4 condenser lens is almost irrelevant. 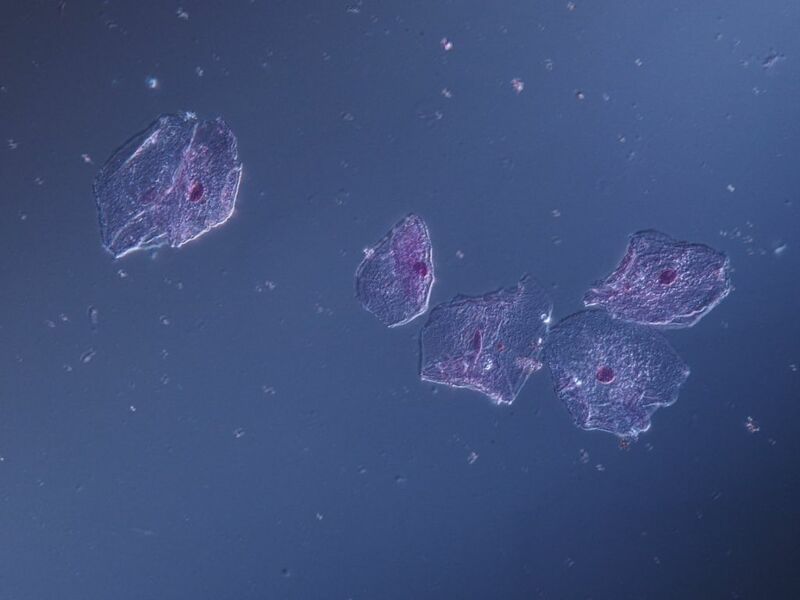 To go back to the original thread, this is a quick-and-dirty fresh cheek cells slide while I have a little time, with slightly different DIC settings at 40x. 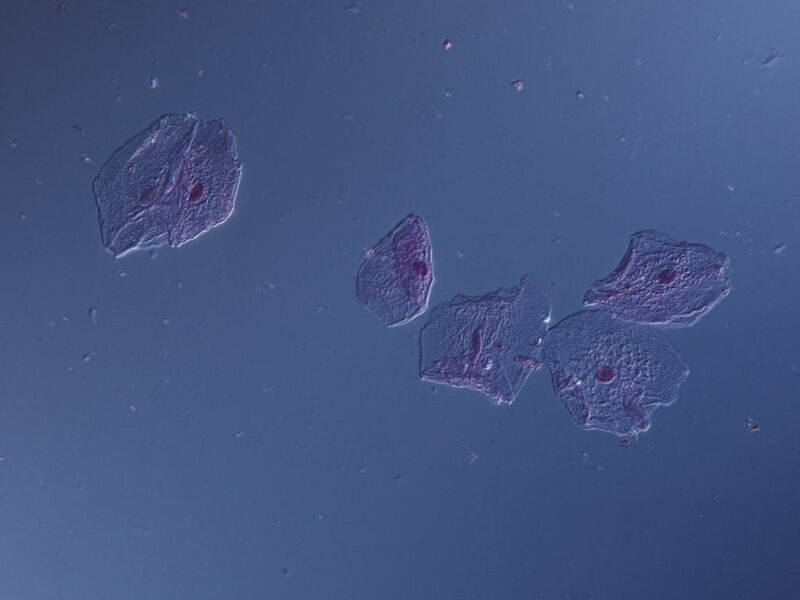 Stained with haematoxylin to locate the cells more easily with 10x objective, which still lacks a matching 10x DIC prism. I did not realign everything yet to try and get get a more uniform background. I'm intrigued by the strong blue hue, do you use an original Olympus polarizer? Camera polarizers not designed to work crossed often produce it while dedicated microscope ones are much more neutral. Yes, original Olympus UIS components all the way through, except for the halogen bulb itself. I use the 100 W halogen light and light intensity set to "photo" with the daylight filter engaged and the camera WB set to sun. I will probably create a custom WB (or two, one for BF and one for DIC) once the most immediate problems are solved. I decided to get the UPlanFl 100x 1.30 with iris after all, since I already have the matching DIC prism for the dry condenser and in case I will eventually bother with switching condensers to use oil immersion on both sides of the slide. 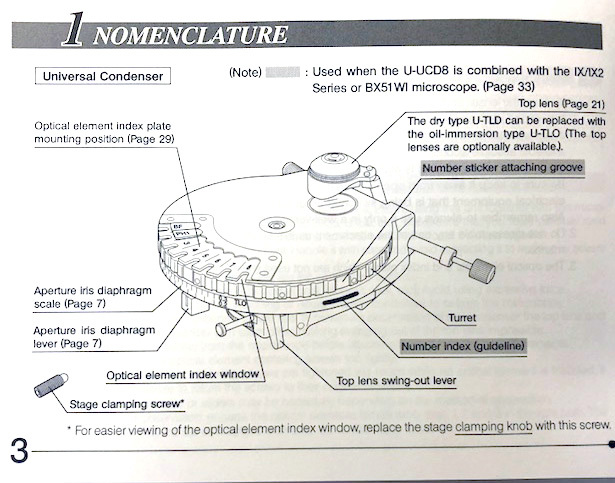 Does anyone know whether simple UIS Abbe oil-immersion condensers with integral (fixed) top lens like the U-AC or U-AC2 allow the mounting of a single DIC prism at the bottom or inside the condenser? My guess is no, but I have found totally zero information on this, either way. These condensers might be designed strictly for BF. PS - It would seem better for me to get the aplanat/achromat U-AAC condenser instead. My question about possibility of mounting a DIC prism applies also and especially to this model. I have similar Olympus BX53 system, and was recommended to have condenser with (U-UCD8) DIC inserts I am not aware of oil immersion condenser attachment. Olympus U-UCD8 universal condenser (works with BX50) has optional oil immersion lens attachment. Thanks Vishnu, my scope has the U-UCDB-2 condenser with U-TLD top lens. I know that it can be replaced with a U-TLO (difficult to get second-hand and none available at present on eBay), but this would require changing also all DIC prisms, which is not an option at present. Also, although the top lenses can be swapped, this is not practical for switching reasonably quickly from dry to oil during a session. U-UCDB and U-UCD8 are expensive, so having two of them is not really my choice. For a second condenser, I am looking at the simpler and cheaper oil condensers with fixed top lens and no revolving disk for prisms/rings. 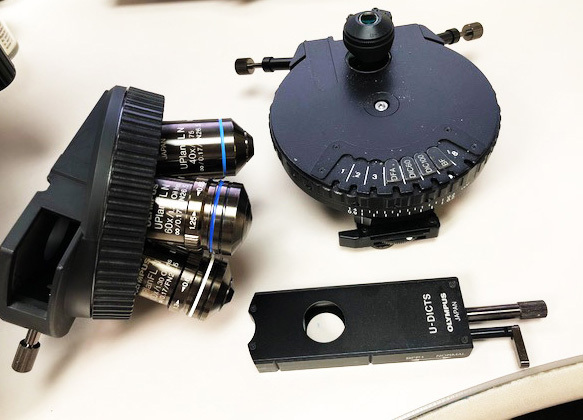 I will still be able to use the 100x objective dry on the condenser side and with DIC at NA around 0.9 with the U-UCDB-2, and swap to the oil condenser when high-resolution work in BF is necessary with the 100x.